Staff file photos / U.S. 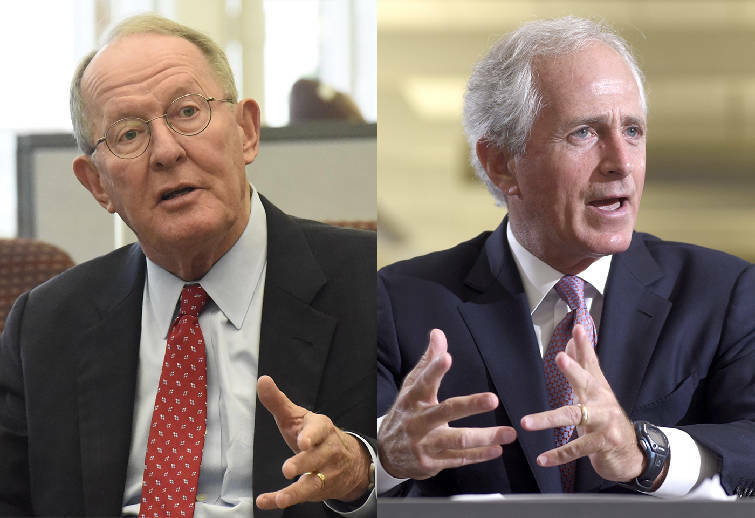 Senator Lamar Alexander, left, praised much of Senate Republican leaders' newly released health care bill, but joined with fellow Tennessee republican Sen. Bob Corker, right, in withholding full support for the time being. U.S. Senators Bob Corker and Lamar Alexander of Tennessee each issued statements Monday decrying the Trump administration policy of separating children detained at the U.S./Mexico border from their parents. "While the issues surrounding our immigration system are complex, we can all agree that innocent children should be protected and not used for deterrence," said Corker, chairman of the Senate Foreign Relations Committee. He said the administration "should use all tools available to stop needless family separation without delay, and Congress should act swiftly to address the serious challenges facing our nation's immigration system." Alexander said in his statement, "Illegal immigration is against the law but new enforcement policies have resulted in hundreds of children being separated from their parents. The administration should end that new policy immediately while Congress works with the president on a bipartisan immigration solution that secures the border, provides a status for those already here and prevents a humanitarian crisis at the border." There has been an increase in the number of migrant children being separated from their parents as a consequence of the new "zero tolerance" policy for illegal border crossings, according to The Associated Press. All unlawful crossings are referred for prosecution — a process that moves adults to the custody of the U.S. Marshals Service and sends many children to separate facilities, the AP reported.